Get a jump start on a successful 2019 at the PC Tan Expo, February 9th & 10th, 2019 at the Hasbrouck Heights Hilton, NJ less than 30 minutes from Manhattan! Saturday, February 9th will feature the latest tanning and wellness equipment, brand new lotions, expert speakers, sunless certification, and much more for $39.95 per admission with Early Bird Admission until January 25th, 2019! Special Hotel rooms rates at the conference location are available at just $109.00 per night. on the latest equipment from KBL, Sportarredo, the Cocoon Wellness Pro, and lamps and lotions from numerous industry-leading brands. GRAND PRIZE ANNOUNCED: a KBL HURRICANE! 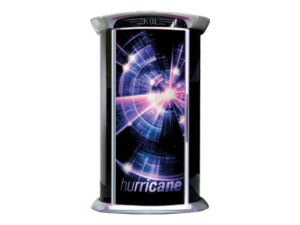 Win a KBL hurricane only at the 2019 PC Tan Expo! Keynote speakers including Dennis Ligon from Sundays Sun Spa Shop, Industry Panel featuring participants from various facets of the industry, product presentations from the industry greats and much more will also be included. JWOWW will also be making an appearance! Featured exhibitors: Ampheta-Trim, ASA, Australian Gold, California Tan, Castleton Capital, Cosmedico, Cryo Innovations, Designer Skin, Devoted Creations, Ed Hardy, Eternal Sun, Fiesta Sun, Hempz, Heraeus, Jwoww, KBL, MR International, Norvell, Pauly D, Pro Tan, Snooki, Sportarredo, Sunless Inc., Supre Tan, Swedish Beauty, Tanovation, Twilight Teeth, VersaSpa, Wellness Cocoon, Wink-Ease, Wolff System, and many more! Gourmet lunch is included with attendance. Prize giveaways, gift bags, and much more! Don’t miss out and register now! Sunless Sunday February 10th! We have something for everyone on Sunless Sunday! Leave no stone unturned- boost your sunless profits by getting yourself and your staff sunless certified. Between Norvell University and California Tan Sunless we’ve got you covered no matter what skill level you are working at, so be sure to sign up for your classes NOW as space is limited! TO BOOK HOTEL AT DISCOUNTED RATE OF $109 PER NIGHT, PLEASE USE GROUP CODE “PCTAN“. THIS BLOCK WILL BE AVAILABLE UNTIL JANUARY 18, 2019.